To my complete shock, I got a check in the mail for Jury Duty less than a week after I went in! The mileage reimbursement was more than I expected--quite nice! 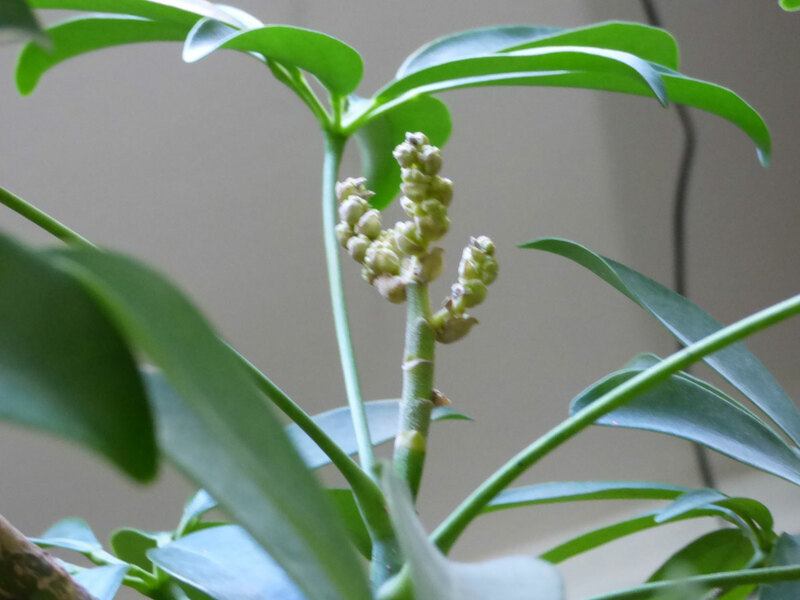 Also to my complete shock, my dwarf umbrella tree Schleffie has produced a flower stalk! I've had that plant for over 25 years, since I was in high school and it was tiny. I don't think I've ever seen a flower stalk on it before. Been really blessed by the favor God has given me on the job. There have been too many times in the past months where my being a klutz (running the wrong test, looking at the wrong section of code, or even just researching a completely different issue) has led to the discovery of something else that needed fixing. Friday, while testing a very scary change that has gone unnervingly smoothly, my test case produced an error for an entirely different issue I had tried and failed to replicate weeks prior. That error's been going on for months, and since I was blessed to replicate it, it didn't take long to fix it. Thank you, God! My picture 'Midwinter Mercy' is FINALLY done! It was supposed to be a quick fun little jaunt, but ended up taking over a month due to how hard it is for poor old Tertius to do the renders of a scene with so much snow. I had to stop one render after 98 hours since I really needed to access the internet! Hopefully my next art project will really be small and 'quick'...that is, 3 weeks or less! It might be -11 out there. Again. But inside I have the treat of one of my new streptocarpus and one new tiny African violet celebrating spring a little bit early. Lovely! Your plants are doing great, they like your place. That is something with the flower stalk on Schleffie. Twenty-five years amazing; how long do they live for? I have no idea! Your question made me curious so I started looking around online. A few other people said theirs started blooming around 29-31 years of age, so maybe that's when they reach maturity? I'm glad you got me looking, because they said dwarf umbrella tree flowers drip sticky sap so now I know to be careful with the carpet. They can be used for bonsai and one website said they had one from 1970--if true, that's a good age!